The Intellectual Property Law Program at the Benjamin N. Cardozo School of Law, Yeshiva University boasts an exceptional full-time and adjunct faculty and a wide range of courses and externships for Cardozo students. In addition to offering a J.D. program, Cardozo is one of the few American law schools that offers an LL.M. in intellectual property law. The program, which consistently ranks among the top intellectual property programs in the United States, is devoted to furthering an understanding of intellectual property law in the academy and among the practicing bar, and to facilitating legal reform. To this end, Cardozo publishes the Cardozo Arts and Entertainment Law Journal, sponsors the Annual Tenzer Distinguished Lecture in Intellectual Property Law, runs the premier intellectual property and entertainment law moot court competition, and hosts frequent ground-breaking symposia and lectures. 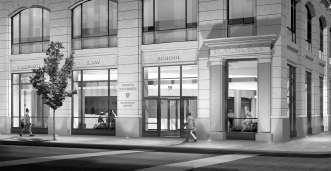 Located in the heart of Greenwich Village in New York City, minutes from some of the world's greatest financial and cultural institutions, the Benjamin N. Cardozo School of Law offers students from around the country and the world a stimulating and challenging environment in which to learn and live. The faculty consists of scholars who are talented, productive, and nationally and internationally recognized; more than 7,000 alumni are represented throughout the legal profession and include many who are making their mark on the world. Cardozo is a vibrant, evolving institution, characterized by intellectual ambition and practical goals. The mission at Columbia University's Science & Technology Ventures (S&TV) is to evaluate, protect, and license Columbia intellectual property, increase private sector funding for research and development, encourage technology transfer, and distribute income from these activities among Columbia entities and faculty. Science & Technology Ventures is the organization within Columbia University that interacts with industry. S&TV started in 1982 as the Office of Science and Technology Development and was one of the first university technology transfer offices set up after passage of the Bayh-Dole law. The early activities of the office were primarily licensing and setting up collaborative research arrangements with industry. In mid-1994 the name was changed to Columbia Innovation Enterprise to better reflect the previous activities of the group. The name was changed again, in 200, to Science & Technology Ventures. Identify and patent new inventions and copyright materials including software and multimediaware. Interact with industry to set up collaborative research agreements. Advise industry of new inventions and negotiate license agreements. Advise companies on availability of new incubator space in Audubon Business and Technology Center. Advise venture capital groups of new inventions and facilitate start-up of new companies. University of New Hampshire Law School, an ABA-accredited law school, is centrally located in Concord, the state capital of New Hampshire. Its relatively small student body is enviably diverse and represents thirty-two countries. In addition to offering, for over twenty-five years, basic legal training leading to the J.D., UNH also awards advanced degrees, diplomas and certificates in education law and intellectual property -- subjects of ever-increasing national and global importance. Graduates work for government agencies, businesses and law firms in over fifty nations. University of New Hampshire Law School, formerly Franklin Pierce Law Center, was founded in 1973 partly in reaction to two shortcomings in U.S. legal education: its failure to effectively teach professional skills and its neglect of intellectual property law - then an obscure specialty and now recognized as the engine of economic growth. The Law School maintains its reputation as one of the nation's leading law schools for the study of intellectual property. The UNH Law School continues to be recognized for its innovative methods for preparing lawyers within a solid academic program. To help ensure that you will feel comfortable practicing in the information age, you will learn advanced electronic trial presentation skills in a state-of-the-art courtroom. Looking toward the future, we are building an addition outfitted with a technologically enhanced smart classroom. The Division of Patents and Licensing (DPL) at University of South Florida (USF) manages USF�s patents, copyrights and trademarks made by faculty and research staff. DPL analyzes USF disclosures of new technologies for licensing and commercialization potential. USF is dedicated to building relationships in the industry and community to develop, transfer and market USF�s research efforts. DPL is responsible for initiating licensing contacts, negotiating and monitoring facilitation of the commercialization of USF�s intellectual properties. We endeavor to educate and promote economic development while directing the movement of new ideas, discoveries and innovation into the commercial and public sectors. Schools that are listed in the School Directory are subscribers to Intellectual Property Notes, which is designed to keep them up to date on recent developments in intellectual property law.